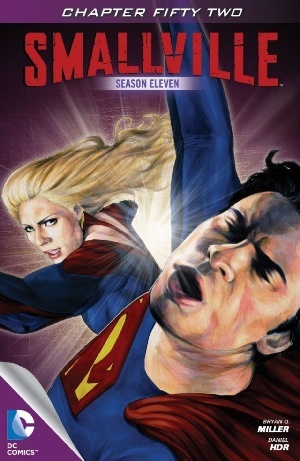 Rendezvousing with the Legion in space above Earth, Superman and Supergirl learn that Doomsday is back and has been unleashed on New Krypton. Just then, New Krypton's gravity bomb arrives. Supergirl tells Superman to go to New Krypton because he has fought Doomsday before, and she leads the Legionnaires to the situation on Earth. Meanwhile, Booster Gold and Skeets escape from their EarthGov captors. On New Krypton, Clark has Saturn Girl provide him with a telepathic link to its citizens so he can speak to them, explain what Doomsday is and his past experience with the monster, and finally encourage them to use their abilities and rise up in self-defense. But it doesn't seem to work and Superman asks Chancellor Pa-Vel to redirect the gravity buoys toward the sun. Pa-Vel warns Superman that not even he can escape the sun's gravity. "I know," says Superman. Back at Earth, the gravity bomb explodes and Brainiac exclaims "we have lost Metropolis" as the city's citizens are sucked up into the explosion's resulting vortex. There is the fact that the Legion ring pulls Clark and Booster ahead in time but not as far as the point at which Protocol Six is activated (which we will later learn), creating a paradox. I had forgotten about "digital" Tess. Turns out that was blissful (i.e. the forgetting). I predict we'll be seeing more of her in the opening chapters of new arcs, but not so much at other times. Why exactly did Skeets have to buy the land in order to remain in that same point in space-time? Also, who buried him in the time capsule? Oh yeah, I'd also forgotten that at one point in chapter 3 they put Clark in a red jacket and give him glasses to disguise "Superman" from the 31st Century Earth authorities but he only wears that outfit while with the Legion in their headquarters. The moment he goes back out in public, he's in his Superman garb. I don't really fuss too much about costume details - briefs or no, precise hue of the blue, size of the chest S, S on the cape... whatever. I do care, though, about wholesale costume changes (irrespective of how "permanently") and about the reasons given for them - that "Blue" costume from "Haunted," for instance, isn't one I necessarily like but at least it served the purpose given to it - namely, allowing Clark to increase his speed and confront the Black Racer. Ok, fine, right? Here, though, the red jacket and glasses end up functioning as this weird and almost schizophrenic kind of reinforcement of Smallville's near-ontological resistance to two features of the mythos in particular: putting Clark in some variation of the "classic" costume and putting glasses on him when not in costume. Clark says he's sorry for getting there so late but the paradox noted earlier (though still not yet exposed/revealed in the story) assures us that he is, in fact, early. This is soon after followed with a "fake science" kind of cheat: Clark says to a befuddled Booster: "I shouldn't have to lecture the time traveler about how little sense actual time travel makes." Maybe not, but the fact that time travel isn't actually real doesn't mean you can fill plot holes in with more plot holes and purposely not make sense. Why even make an issue of this? Why not have had Clark and Booster arrive at the moment when the Legion enacts the protocol? Can I just be honest? This is not a very smart time travel story. The "gravity buoys" are simply weak MacGuffins - like, really weak. "The only way for Kryptonians to fly through space with any kind of purpose," Kara says of them, her emphasis on purpose. Why? What does that mean, "with purpose"? She and Clark fly up into space unaided and then she seems to reveal the presence of the buoys with her heat vision. Clark isn't even aware of them. What on Earth or New Krypton is the deal here? They seem to have something to do with enabling them to get between Earth and New Krypton, but as they're clearly in the same yellow solar system and as when Kara departs the scene she flies over them, they really come off as extraneous to the maximus. They make a return this week, too, and still don't make sense. The difference between Argo and Worldship New Krypton is not clear. At the end of chapter two, we plainly see a second planet up there, presumably further out than the moon based on its size. That's referred to as New Krypton. Later, in chapter 5, Chancellor Pa-Vel tells Clark that "the vessel that would eventually become the Worldship 'New Krypton' was painstakingly grown and tended" and then Clark somewhat dismissively cuts him off before he can say what the hell it actually is. It looks like a planet. But evidently it can also be driven, or something. Does Miller even know what it is? I'm sort of thinking (hoping?) the green light in the sky the Kandorians apparently saw when they arrived on Argo is a tease for an upcoming Green Lantern appearance, preferably Guy Gardner (what can I say?). Otherwise, it's completely unexplained and therefore extraneous. Why bother trying to grapple with the quasi-religious undertones of this whole Faora-as-god business? We're MacGuffin'ing our bloviating butts off here! Sometimes Clark and Rokk look identical, and I can no longer be sure that one of them isn't in a disguise. Ah, Zod's fortress. Another thing I'd blissfully forgotten. We then learn that EarthGov is just mind-numbingly stupid, having conveniently left behind cartridges of a DNA extraction device from when they came to extract DNA from Faora's unborn child. And Kara has little short-term memory: having just finished hearing from Clark about the Legend of the Unborn Key Child, she gets the final line in the scene: "What would EarthGov want with DNA from her unborn child?" It isn't clear why they need the DNA to resurrect Doomsday. The implication would seem to be that because he's technically the "son" of Zod and Faora (though it is not explained how Niedrigh would know anything about that), the unborn DNA is the same or sufficiently similar for whatever purpose it's needed. But why is it needed? Not explained. I'm having to do this thinking for them, from what I can tell. Niedrigh refers to something they "unearthed beneath old Metropolis," and Clark this week says he should have buried it deeper - i.e., it's the same Doomsday as the one from Season 8 and should, thus, already have its own DNA. Why wasn't the solar radiation they say they also infused him with enough? Suddenly, this whole Faora-as-god-and-legend-of-the-unborn-child's-key-to-unlocking-the-future-of-Kryptonian-DNA-(or whatever) business is exposed as simply one seriously convoluted and more than a little arbitrary excuse to bring back Doomsday. I'm having flashes of ancient witches and tattoos, to my horror. Here's a close-up of Rokk's face. Looks like Supes sometimes looks. Did I mention that already? The "ancient technology" has an Omega symbol on it. Not sure I caught that last time. Tease for the return of Darkseid, maybe? Otherwise, I'm not sure we're expected to know what the cellphone-resembling device is, but I don't. If there's a precedent, someone please let me know. The "gravity bomb." Supposed to be thinking connected to the "gravity buoys," I guess, but still no idea how or why. Oh yeah, FIGHTING�. Way to "lose your temper" there, Supergirl. And finally, chapter 8, this week. Those gravity buoys get lots of play! Is their point simply a combat-tactical one: a delivery mechanism for the gravity bomb? I will be very happy if that is explicitly acknowledged next week. But Supergirl here also tells Superman to "ride the buoy line." And, again, why? Are they supposed to improve the buoyancy of the Kryptonians to assist them in flying between New Krypton and Earth. We see a bunch of people flying in space, and none of them need the buoys. Or maybe they only affect buoyancy where the gravity bomb is concerned and are just navigational aids for the Kryptonians. But we could see New Krypton from Earth at the moment Clark is arrested. How difficult could it be to find your way back and forth, assuming you can fly and survive space to begin with? No, like putting Clark in that jacket to a purpose that was then immediately ignored, these buoys are, in a word, distractingly bizarre. The bro drama between Booster and Skeets is actually endearing, and I'm curious to see how Booster will finally become a hero in spirit when he plays a pivotal role in saving the day next week. Now, Clark inspiring the Kryptonians to rise up against Doomsday? Cool! That's a highly appropriate way to continue the long-running Smallville theme of Clark being the light who brings others out of darkness, and so on. And then there's the crises on two planets. The classic conundrum: How will Superman save them both, New Krypton and Earth? The gravity buoys are seemingly going to play a role in getting Doomsday to the sun and, presumably his destruction... assuming solar radiation wasn't critical to his resurrection to begin with, I guess, but let's maybe not talk about that. But then, with the buoys redirected, won't Superman be unable to find or even fly his way back to Earth in time to prevent Metropolis from being sucked up into the vortex created by the gravity bomb? So, I don't know... I read everything up to now again, in one go, and frankly it kind of made things worse. At least for me. Art - 3: What I said last time: "Pretty good work with the pencils, though as seems to be a regular feature of this title, fidelity of individual character's likenesses (not even to the show's cast but just to themselves) is weak from panel to panel and wide-angle panels in general suffer from a lack of detail. I'd be pretty disappointed with this work if it was in one of the monthlies."